The top stallion on the Lewis farm in the mid-1970’s was Goldfingers, whose titles included AQHA Champion; National High Point Steer-roping Stallion; World’s Champion Heeling Horse; and High Point Halter Stallion of Nebraska in 1976. 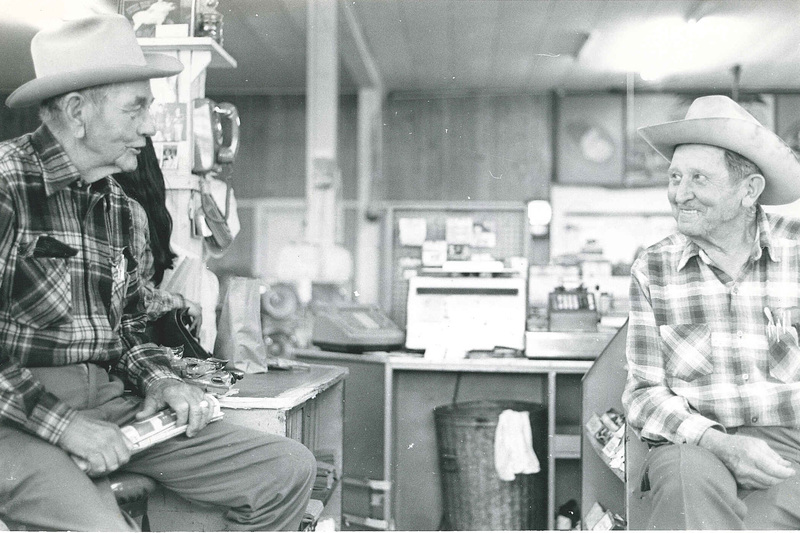 He serviced 80 mares in 1977 on the Lewis farm. “You better grab the twitch, Jimmy. She ain’t gonna like this,” said Burl Hollar, 32, as he plugged a shearing machine cord into an electrical outlet. The sorrel yearling filly tossed her head nervously as 19-year-old Jimmy Stewart brought two small steel rods, connected together like a pair of pliers, up toward the yearling’s head. He patted her nose briefly and then clamped the rods around her nostrils. Hollar stuffed a cotton tassel into her ear and started trimming the hair growth within the ear of the young horse. After finishing both ears, Hollar trimmed and curried the mane. When the haircut was completed, Stewart led the prancing yearling into a sandy pen within the breeding barn, tied her halter to the back wall and then turned a hose on her at slow speed. The filly obviously wasn’t used to water either. She tensed her muscles, flared her nostrils, whinnied and stomped about as much as the short halter’s length would allow. As her hide wetted, gleaming highlights gave depth to her musculature. Her eyes were at their widest, and short wheezing noises came from her flaring nostrils. All the vitality of Nature seemed concentrated in that one being. Burl Hollar is the stallion manager and resident trainer on Vera Lewis’s 160-acre horse breeding farm in Ashtola. He’s the archetypal trainer: tall, lanky, affable and patient. He wears high-topped boots with his jeans stuffed into them and a red baseball cap while working. Hollar loves horses enough to take exception to any suggestion that horses are less intelligent than cows. “I guess what they mean by that is that a cow wouldn’t damage itself like a horse will,” Hollar said. “A horse will run straight into a fence. “Still, you can’t train a cow to cut out calves — or colts. You can train a horse to do a lot of things, and then he’ll seem pretty intelligent to you. It’s all in the training. “Of course, I’ll get mad at them, and then I’ll call them the dumbest creatures alive. But usually, when they do something that makes you mad it will all be because of something you did that was wrong in the first place. Besides being stallion manager and resident trainer, Burl Hollar also functions as medic. He filled two hypodermic needles with a sulfa drug and gave one to his visitor to hold, saying with a grin, “If you stick around here long enough we’ll put you to work.” Then he walked over to a chute where a four-month-old colt stood with flies about its eyes and a thin line of foam along its lips. Hollar injected the sulfa into the colt’s neck and rump and set it loose. Stitched into the front of Burl Hollar’s cap was a patch with the words: You can believe in Sonoita Blue, AQHA Champion. Sonoita Blue had served as a stud on the Lewis farm for four years before he died last year after eating a rare poison weed. He was seven years old at his death. The top stallion on the farm now is Goldfingers, whose titles include AQHA Champion; National High Point Steer-roping Stallion; World’s Champion Heeling Horse; and High Point Halter Stallion of Nebraska in 1976. He has serviced 80 mares this year on the Lewis farm. “Mrs. Lewis keeps one to two stallions here,” said Bob Boston, general manager of the farm. “She has about thirty brood mares of her own, and about four years ago we started accepting mares from other places for breeding. We get mares from as far away as Maryland. Last year we had one from Florida. “Ordinarily,” said Bob Boston, “it takes twenty days to breed a mare and another forty days to tell if she’s pregnant. 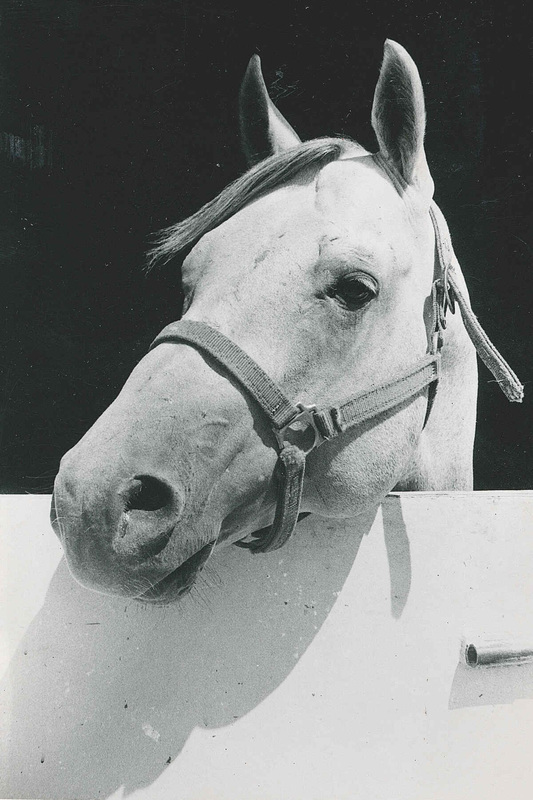 We don’t like to keep them in these stables and corrals any longer than we have to because it wears a horse down to be out of pasture too long.” In one of the stables a yearling filly whinnied excitedly, bucked and rammed against the gate as she watched another yearling being led out of the stable yard by Jimmy Stewart. Shortly, however, Stewart returned and took the excited filly out, too. “Jimmy’s taking them to the hotwalker,” Hollar explained. Around one corner of the barn under some shade trees stood a large metal-and-rope contraption that resembled a merry-go-round. In the center of the “merry-go-round” — or “hotwalker”, — as Hollar termed it, stood Stewart. Around him trotted four yearlings. A young horse’s way of saying, “Let’s go out and play!” certainly differs from a pup’s scratching on the screen door. And giving a filly a bath seems in no way to compare with dunking a kitten in the tub. Yet it’s all a matter of magnitude. A full grown stallion pawing at the ground and letting out a hearty whinny is a good antidote for a man who, used to manipulating pups and kittens, has come to assume he can easily master the entire animal kingdom. Some things you’re better off not looking at too closely. One of them is Thanksgiving. It doesn’t matter whether you’re Christian, Jew, Muslim, or pagan. How can you count your “blessings” without their being contrasted with somebody else’s “lacks”? If you are blessed, are they therefore condemned? How can we keep from choking on our turkey when we know people are starving here and across the world? Still, it is not, strictly speaking, our fault. We have tried to get food to war-torn areas as well as to places where natural disasters have rendered people homeless and even isolated. Even to share our “bounty” has sometimes become such a problem as to require diplomats, as was the case in Cambodia in 1979, when I published the original version of this essay. And yet I wouldn’t have Thanksgiving not be. It has always been my favorite holiday — based on a religious origin yet not as heavily saccharine as Christmas, nor as ridiculously extended. Many of us will be taking off to distant places (if we can afford the gasoline or plane tickets) in order to spend a few days with our relatives, whom we may not have seen for a year or more. We’ll all disappear into warm houses and have a cordial meal. We’ll look at photos and watch three or four football games. If we’re wise and not too lazy, though, we’ll walk a few times around the park to aid digestion before we bury ourselves in those easy chairs. That’s what I like about Thanksgiving, getting all muffled up with only the face exposed to get a red nose from the frosty air. It will be dusk, with just enough daylight to create an orange-red horizon as though there were a forest fire going on over the nearby hill. The trees, without a single leaf left, will lose their definition as we observe them from trunks to twigs, and they become a mousy gray mass at the top, where they meet the golden and purple sky. All the field of grass will be brown and quiet, not a breath of breeze to disturb it. But no, a rabbit just jumped out of a clump of bushes we were passing and darted in a triangular pattern into another hedge. Down the road a ways, some little boys will be playing football in the park, in their imaginations identifying with their NFL heroes of the time. As they fall and roll they collect bits of the brown grass and dead leaves on their coats and stocking caps. The next day we can return to the concerns of Iraq and our own stumbling democratic discourse. Just for this day it is better to forget it all and to lose one’s self in a revery of the scene of frost and trees and boys playing. That’s what I can be thankful for. NOTE: Due to historical changes since this essay’s first version was published in the Monahans News (Nov. 22, 1979), I have altered its content so much as to render it almost a different writing. NOTE TO READERS: In 1981, while I was the editor of the Monahans News, I bought a small bungalow, and I was very proud of my three fruit trees, three grape vines, two non-bearing mulberry trees and manicured lawn. However, one of my neighbors had a dog which he allowed to run loose part of each day, and that animal loved to come over to my front lawn and drop his waste products on my St. Augustine grass. At a county commissioners court meeting during that time, the animal control warden’s problems with stray dogs and their owners was on the agenda. Those two elements combined led me to write a column critical of inconsiderate dog owners who allowed their animals to run loose, chase joggers and mess up people’s properties. Our local veterinarian came to the dogs’ defense, and a brief, friendly debate developed between him and me. The two columns reprinted below depict the essence of our disagreement. I concede that I was a bit harsh in my first commentary and should have acknowledged more of the benefits of pet ownership, especially for the elderly and the mentally disturbed; but I still hold to my tenet that no animals should be allowed to roam alone throughout a neighborhood. I live in a well-regulated apartment complex now, so the only dog problem I encounter is one small dog across the courtyard who hates to be alone outside so much he barks the whole hour or so he has to endure it. Sure hope there are no dogs in heaven (at least not of the barking, biting or messy varieties), which for certain is my next stop. 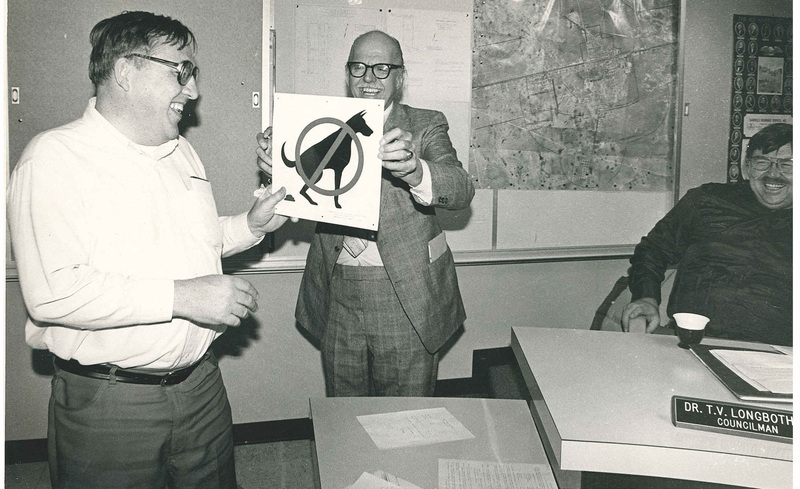 Monahans (TX) Mayor Richard Hoyer presents News Editor Bob Litton a metal sign in recognition of Litton’s columns castigating owners of stray dogs. The Ward County commissioners commended County Animal Warden John Tackett Monday for picking up the strays in the county. Then, Commissioner J.H. Raglin, who is Tackett’s direct supervisor, brought up a problem the animal warden is encountering — vandalism. I must admit to a little bias here, since I’m neither a dog-owner nor a dog-fancier. Everybody, I suppose, should have the right to keep one of the little curs around the house to scare away burglars. I just don’t believe they should let their animals loose on the street where the beasts can attack mailmen, joggers, bicyclists, and just plain strollers. I’ve seen them roaming in packs around Monahans. They drag ant-infested hunks of bone into people’s yards and, lying spread on their bellies under a shade tree, they gnaw away at the bone. Then it’s time for Nature’s other call. How they love a nicely manicured lawn of St. Augustine for their deposits! Some dogs — a very small minority — are at least useful for something. There are dogs that lead the blind, dogs that pull sleds, dogs that sniff out dope and time-bombs. I salute such animals which at least partly justify their existence and earn their keep. The greater number, however, are useless except as symbols of conspicuous consumption. They leave residues of hair and fleas on couches and carpets; they chew up electrical wiring and furniture, and they eat up a good share of the family’s income. But worst of all, as far as the neighbors are concerned, they howl and bark. A dog — if a person insists on having one — belongs in a fenced-in yard. His water needs to be kept full and fresh. He needs some kind of shade. And his messes need to be constantly and hygienically removed. Never should he be out roaming the public thoroughfares. Local veterinarian Dr. Bryan Stuckey stopped me on my way to lunch the other day and gave me two recent issues of Veterinary Economics. “Bob, would you read the articles I’ve marked in these magazines?” he asked. I opened one issue to see what they were about: “Pets are wonderful…Communicating the Rewards of Pet Ownership”, it read. I smiled, surmising that this was Dr. Stuckey’s way of responding to my recent harangue against yard-polluting dogs. “Okay, I’ll read ’em,” I said. It appears that back in 1975 the editorial panel of Veterinary Economics had written an “Open Letter” to Time magazine as a rebuttal to a series of articles Time had published about pets and pet-owners. Because Time didn’t publish the letter, the panel concluded that the magazine was conspiring against the pro-pet crowd. “By not using it, Time’s editors demonstrated their belief in a philosophy which places reader-attracting sensationalism above accuracy.” It perhaps never occurred to them that the letter may have been lost in the mail or among the in-baskets at Time. No, it had to be a conspiracy. But the central point of the article was only indirectly related to the media. The big subject was “PAW”—Pets Are Wonderful. (Get it?) PAW is a full-fledged publicity campaign under the sponsorship of Pet Food Institute to put before the public the positive aspects of responsible pet ownership. Other positive aspects of pet-ownership mentioned in the article are: (1) walking a pet also exercises the pet-owner; (2) caring for a pet reduces the impulse to feel sorry for one’s self; and (3) if you own a pet, you are statistically likely to live longer, get sick less often and more likely to have a milder ailment than someone who does not own a pet. I don’t have any quarrel with those points. I just think they do not refute my own argument that pets do not belong on the public thoroughfares unless they are under the control (via a leash) of their owners. Nor should they be allowed to bark and whine at any hour of the day or night. Nor should they be allowed to go into a neighbor’s yard and leave smelly reminders of their visit. For certain, it’s not the animal’s fault if it goes around biting people or messing up lawns. It’s just following natural principles. Rather, the fault lies with pet-owners who are inconsiderate of their neighbors by letting their dogs run around loose. I hope Dr. Stuckey doesn’t take this personally. He’s a decent fellow who has done a lot of good things for this community. I appreciate his showing me those articles primarily because his having done so indicates an all-too-rare willingness to enter into dialogues rather than just go off in a huff. During my first few years as editor of the Monahans News I would return to my hometown of Dallas about three times a year taking the US67 route. That way is more dangerous, in a sense, than is the I20 route because it is (or was during the 1980s anyway) a two-lane highway and I too frequently found myself caught in an unorganized “caravan” of vehicles; at such times, passing three or four other vehicles by going into the oncoming traffic’s lane is a dare-devil’s game. However, on the positive side, US67 is much more scenic and — except for the occasional “caravan” — more relaxing. 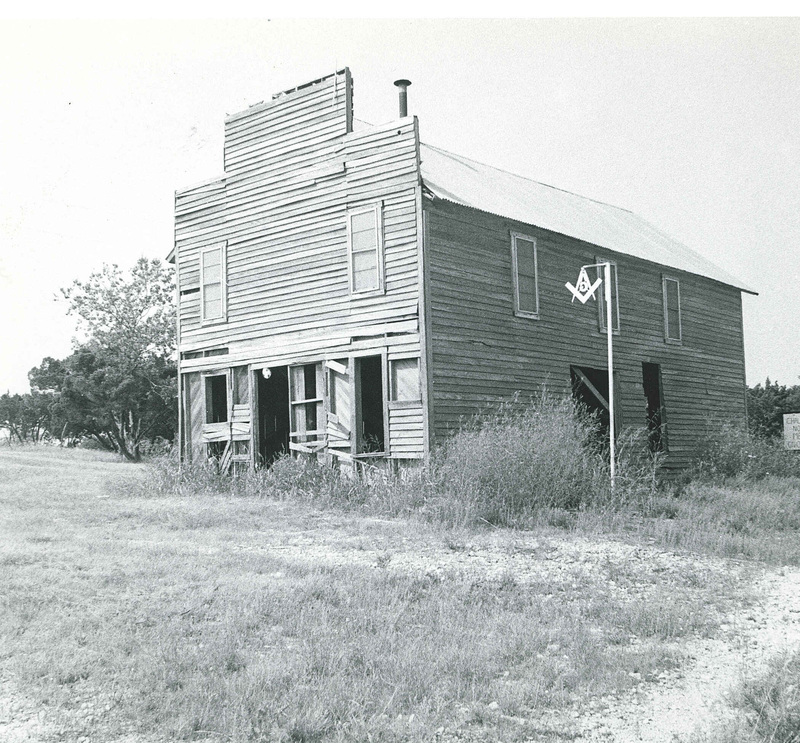 It was while I was headed to Dallas one day that I noticed the “ghost Masonic lodge” above, somewhere between Brownwood and Weatherford. It must have been the time of my high school class reunion because I had the newspaper’s camera with me and there was no other reason for me to be toting it to Dallas. I am always attracted to objects (and people, too) who are not beautiful in the conventional sense but are uniquely odd. Here was this old general store-like structure that looked like it was probably dangerous to enter and yet with the Masonic emblem still dangling from a post. I just had to capture that image for myself and for posterity. I have not driven on US67 again in more than twenty years, so I have no idea if that “ghost lodge” is still standing. An even odder structure captivated me a year or so later — this old prairie shack on the south side of TX80 a few miles east of Barstow in western Ward County, Texas. A local ranch foreman informed me recently that such little one-room shacks are (or were) used as resting spots by cowboys settling in to rest a bit off their horses or as shelter from storms. 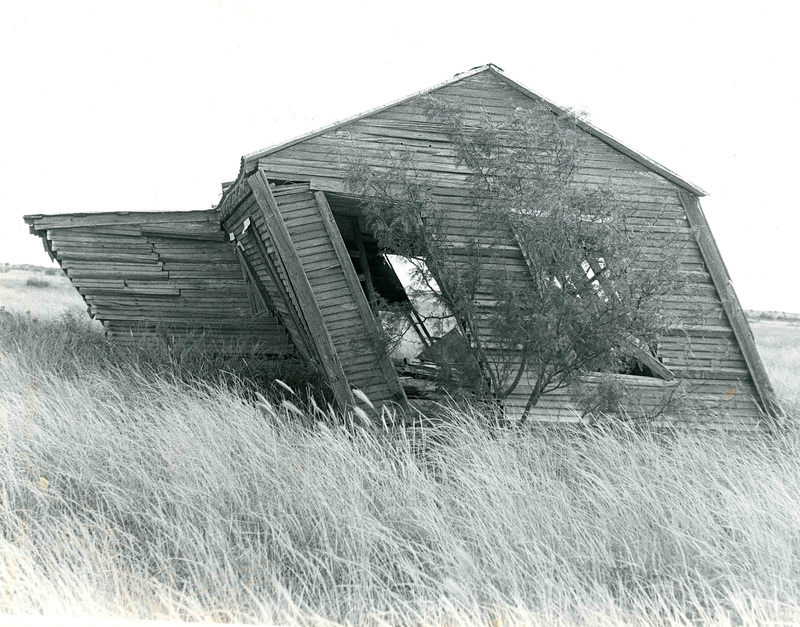 But, as you can see, what makes this particular shack uniquely interesting is that it has become severely weathered and warped and pushed almost to the ground by West Texas winds. I frequently passed it during my years at the Monahans News when I traveled to Barstow to gather news. Eventually, of course, I saw as I drove by that it had finally collapsed. Not all my interest resides solely in empty, weather-beaten buildings, however; I do have a place in my mind’s pleasure palace for people, both young an old. One part of my job at the Monahans News was to go out with the camera and try to find appropriate images that told a story whenever there was a change in the weather. Too often we had to rely on scenes of vehicle tires splashing through rain puddles or sliding on black ice. 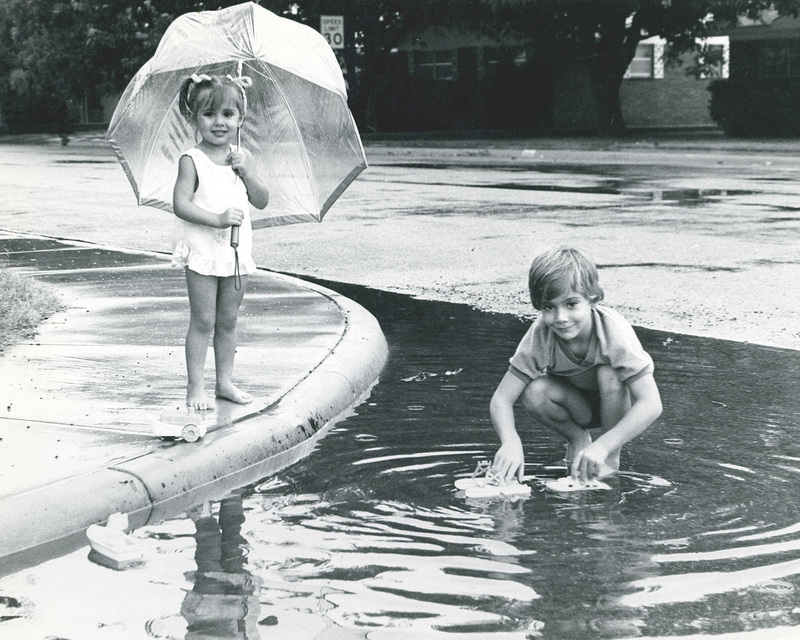 One day, however, I was much rewarded with a unique scene — the brother and sister above illustrating the fun a good rain can be. Oh! How that image arouses memories within me of my own childhood joy of building little mud dams by the curbside to divert a small stream of rainwater! I will have a few more photographs to present for your entertainment (I hope) in the near future. For now — in case I do not publish anything between now and the approaching holiday — Happy Thanksgiving, everybody! Back in 2010, I spent several months in library archives searching microfilm reels for articles and columns I had written during my twenty-year career as a reporter and editor of community newspapers. I copied, edited, and “burned” (i.e., printed) two hundred of the ones I considered still relevant or at least interesting, on a CD-ROM. Initially, I had planned to sell the CD’s through local stores. However, the proprietors of those stores balked at the idea of selling a “book” that people could read only on a computer’s monitor. So, after “salting” my CD in the local library and in the archive centers of the four counties where I had worked as editor/reporter, I gave away the forty-plus remainder to friends and anyone else who might be interested in reading them. Since originating this blog two years ago, I have published a bunch of the columns from that CD on my blog, usually at those times when my well of topic ideas was practically dry. On the CD, I also included a preface and an introduction–the latter imaginatively composed by one of my favorite people, Geoffrey Chaucer. This morning, nostalgia impelled me to pull up that introduction and re-read it for the twentieth time. Then the notion occurred to me of publishing it on my blog; for, to me, it is hilarious both because of its setting and because of its ultimate conceitedness. Please read Chaucer’s praise of my writings…and, hopefully, have a good laugh. By Seynt Thomas of Kent! What hath awaked me fro myn slepe depe? Lo, this lode of papers som persoun dumped on myn bony breast and eke a letre wryten in spelynges moste straunge. Lat me se what the sentence of hyt myght be. Pardee! But this wast labour ageyn myn greyn! Natheless, there ys humour and sharpness, too. Thys elder wight whome som clepeth “Bob” and others “Robert”, wast born to wryt and drawe. In myn minde, y kan se the persounes and places he descryves. Noon other wordes neden he! And the variaunce of his topics the world myght belt. Som of cours y ne wiste: what, by Seynt James, ys “Little League”? This bok nedeth a “glossary” lyk the pryntours pressen on me. Heh, heh, how lykest thou tho lyte pun? Ywis, what he seys in ther ys wel thoght and expres. For, to tellen soth, boys sholde ne be forced to compete in games ahed of kyndely tyme. This Bob eke a repourter wast and lerned mikel about gres rote democracie, which he preysed and fostred and defended even somtymes ageyn folke who claimed hyt was theirs to chaunge in yvel ways. Her, another enditing tells of doctors’ greed, and how they squeezed the utmoste pence from tho who were sik yit had lyte of money to pay for tho care. All this he puts in forme muchel straunge, as of a government meting where a fysiciens’ spokesman spekest in sophistryes and the doctours’ are purtreyed as cutte-purses, and cutte-pursing as an industrie out of honde. O, hyt is a werk that wold warm myn herte…had I still oon…for I love satyre and the humouryst’s art. So, selle this bok, boksellers alle, forwhy hyt be wryten by the best writer in the Englysh tongue since…since…why, since me! —Excerpt from the merchant’s wife’s comments to the horny monk in “The Shipman’s Tale”, Canterbury Tales. Since capturing the HGT trophy on December 28, 2013, Amira has entertained at concerts in various countries, including South Africa, Germany, Switzerland, the U.S., and Argentina; been given a special “master class” in London by her hero-conductor Andre Rieu; and performed during one of maestro Rieu’s outdoor concerts last July in Maastricht, Netherlands. After hearing it announced that she had won the HGT competition, Amira revealed for the first time her impish sense of humor by lying on the stage with her arms and legs pointed upward in mimicry of an animal playing dead. Later, while being interviewed by one TV host in Germany and by another in Argentina, she again revealed, more subtly, this aptitude for the comic. Her jesting humor became apparent when she responded to their questions. Regarding the Maastricht concert, I really admired Amira’s onstage behavior, especially the way she curtsied in three directions during her curtain call. There were two aspects of the concert, however, which disappointed me: (1) they had costumed her in what was purportedly a medieval princess’ dress and bonnet; and (2) the acoustics were less than desirable due to the fact that it was an outdoor event. The latter problem, of course, could not be avoided, as far as I know. As for the dress, though, I think they would have done better to have donned her in the dress she wore while singing “Nessun Dorma” at the HGT finals, or even the simple outfit she wore at her audition in October 2013. (Like a Quaker or a Shaker, I always prefer the plain and simple over the fancy and gaudy.) None of the videos I watched after the “contest” ones were as good as those three, where the acoustics were superb, the cinematography commendable, and the dress modest. I will concede that the dropping of bits of blue and gold confetti all over Amira at the end of her audition, and after she was announced the winner in the finals, was an uncalled-for nuisance. Nor did I find that the simulated water waves during the “Nessun Dorma” performance added anything to its appeal. Naturally, there have been some critics of Amira’s rise to operatic stardom. There is one mudslinging female blogger who says young girls should not try to sing opera, which, she claims, requires intimate knowledge of the languages and histories of the countries where the operas were composed. Others opine that heavy-duty aria-singing can damage a young person’s throat organs. In the present instance, the criticism is really aimed at those who encourage a young girl to sing a song uttering the pleas of a young woman to her father and threatening to drown herself in a river if he does not grant her wish. Okay, it’s a tragic scene. Should children be exposed to such horrific words, either singing them or hearing them? Well, look at the folk tale of “Hansel and Gretel” and 19th century composer Engelbert Humperdinck’s derivative opera: parents abandoning their children in the forest to let them starve there, a witch fattening a boy for her supper, a girl pushing the witch into an oven. That story and many similarly rough tales we endured…need I say enjoyed…during our childhood. That much being given, what difference does it make what aria a young girl sings, as long as she sings it prettily. If the issue is the age appropriateness of a nine-year-old wanting to buy an engagement (or wedding?) ring, there are many occasions in all the arts where we are expected to suspend disbelief: Even I, at the age of twelve, eagerly used to sing the “Theme from High Noon” during music class talent exhibitions, and nobody ever commented to me on how absurd that was. Finally, there is a pretense of “rivalry” which some people on the Internet have tried to foist on Amira and her American contemporary, Jackie Evancho, who won her own singing contest when she was only ten years old – four years before Amira. But these young ladies apparently are not jumping into that mud puddle. (Good for them!) Jackie gave Amira a “shout-out” on one of her Web sites, and Amira included Jackie among the persons she thanked on the booklet that accompanied her CD. At nearly 75 years, I seriously doubt that I will be able to watch – much as I would like to – Amira’s progress into a potentially great operatic career. As Amira’s grandmother poignantly noted not long before dying, “She belongs to the world now.” But I am content with what I have been able to see and hear thus far. And, on my blog’s stats page listing of “views” I see 21 “views” on the “Amira” post during last June and July. I hope at least one of those “views” was on the Willighagen family’s computer. © By Bob Litton. All Rights Reserved. The Republicans love to indulge in memes; they find, as did Goebbels, that people’s attention spans are so short, their patience so tentative, and their intellects so shallow that they will be more readily swayed by brief “clips” and “slogans” than by sound reasoning. They have used the “I am not a scientist…” meme ad nauseam when discussing evolution and climate change during the 2014 mid-term election campaigns. Practically all the media have pointed to this Republican habit. Last September 17, MSNBC reported: “Sen. Mark Rubio (R-Florida), for example, was asked how old he thinks the planet is. ‘I’m not a scientist, man,’ he replied. Gov. Rick Scott (R) was asked what he intended to do about the climate crisis threatening Florida. ‘I’m not a scientist,’ he responded. House Speaker John Boehner (R-Ohio) was asked about the climate (change) deniers in his conference. ‘I’m not qualified to debate the science,’ he replied.” No, they do not want to debate evolution and climate change; they just want to retain that ol’ time ignorance that was so comfortable back in the Middle Ages. And they want to tear up the Earth for oil, coal and (in the Amazon) gold, at the behest of their billionaire supporters. There are several reasons Democrats have lost elections, especially for the presidency, which really is just a popularity contest dependent more upon the candidates’ barbers and haberdashers than their ideas. However, the only reason I think is pertinent here is that most of the Democratic presidential contenders were too intelligent for the average American. I am nearing my 75th year, so I can only trace this perception back to Adlai Stevenson, Hubert Humphrey, George McGovern, Walter Mondale, Al Gore and John Kerry. I believe the candidacies of these nominees were negatively affected by their being perceived as too intellectual. Particularly during John Kerry’s minutes at the debates, I thought too many of his responses–even though I understood them and agreed with them–were above many voters’ heads and were not concise enough. While it is true that Goebbels-style “memes” are toxic to democracy, it is also true that argument threads that extend too long are toxic for a political campaign. Nonetheless, those men stuck to their intellectual idealism, and I will continue to do the same. When I initiated this blog, I resolved to avoid political commentary, and I hope I won’t break that resolution again. This is a time, however, that tries my soul.